Server-Sent Events are a technology for providing push notifications from a server to a browser in the form of DOM (Document Object Model) events. The Server-Sent Events EventSource API is standardized as part of HTML5. 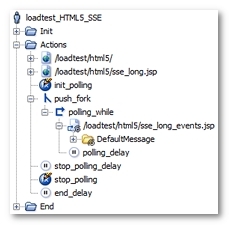 After the recording, a User Path with the HTML5 Server-Sent Events (SSE) technology is displayed as follows. Once processed by the NeoLoad Post-recording wizard, the User Path is modified as follows. 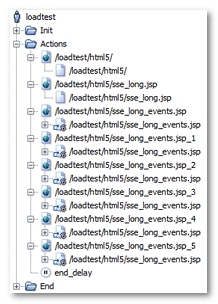 All the requests generating events are collected in a single request, for example /loadtest/html5/sse_long_events.jsp. The request is included in a while action, for example polling_while, which iterates until the NL-stopPolling variable generated by NeoLoad switches to true. Also, the while action is itself in a secondary execution thread with the fork action, for example push_fork. For more information, see Polling requests. The variable modifier init_polling initializes the NL-stopPolling variable, with the false value, to have the polling function work on every Virtual User iteration. The polling_delay polling delay is extracted from the polling response. When the server sends a reconnection order, the variable is extracted. Otherwise, the default value is 3 seconds. The delay simulates the timeout between two requests. The stop_polling variable modifier makes it possible to stop the polling loop by changing the value of the NL-stopPolling variable.